← How Pozzolan Additives are Used in Concrete? 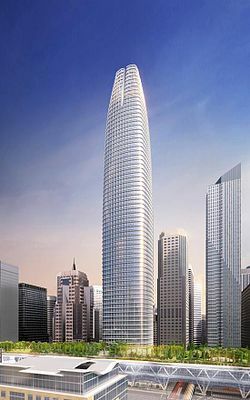 The Salesforce Tower in downtown San Francisco is one of The Conco Companies more recent projects and we are currently preparing to do another huge mat pour for the Tower. This new undertaking will be the largest continuously pumped mat pour done in San Francisco, and by the end of the pour, we will have placed nearly 14,000 cubic yards. In recent interview done by the San Francisco Business Times with Michael Tymoff, the senior project manager for the development company, Boston Properties, mentioned that the building could exceed LEED Platinum certification. Presently the building is pre-certified for LEED Platinum but is intending to add features that are certain to increase the energy efficiency of the Tower such as wind turbines on the roof and other power saving ideas. The building is loaded with high-end features that include tall ceilings on each floor that will be as high as 13 feet tall, and 10 foot-high windows throughout the building to offer fantastic views. Furthermore in an effort to provide exceptional air quality, every floor will have 100% natural air pulled into the building by units that are located on the floor. The $1.1 billion project is expected to be complete in 2017 and with a height of 1,070 feet; it will become the second tallest skyscraper west of the Mississippi, just behind the Wilshire Grand Tower. In addition to the mat pour, Conco was awarded the concrete and rebar contracts for the building. The building will consist of a concrete core with a structural steel frame that will require lightweight concrete to be pumped to the kinds of heights we have successfully been doing for the Wilshire Grand Tower project in Los Angeles. Conco is one of the leading concrete contractors in San Francisco offering a range of innovative, quality services. We have been honored to work on many high-profile projects and were recently awarded the concrete contract for the San Francisco 49ers Stadium. Our concrete services include commercial, educational, parking and other construction development as well as public works projects. This entry was posted in Commercial Concrete Contractors Bay Area, Concrete Pumping and tagged commercial concrete contractors, salesforce tower. Bookmark the permalink.